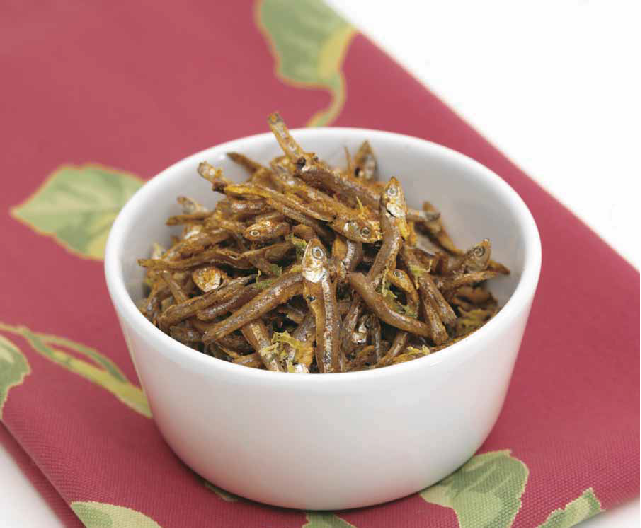 Teeming off the miles of Philippine coastline are tiny anchovies called dilis that are dried and eaten the way all good pulutan finger food should be enjoyed—with plenty of beer to wash it down. It’s easy to get hooked on these fried seasoned dilis that are simultaneously salty, sweet, spicy, and crunchy. Dilis are most often eaten plain with just a simple dipping sauce of vinegar or soy to add extra flavor. However, I found that combining dilis with other munchables—roasted peanuts, sunflower seeds, or even dried fruit such as banana chips—makes a uniquely addictive snack that satisfies both sweet and salty cravings. 1. In a small bowl, combine the lemon and lime zest, salt, sugar, and ground red pepper. Stir to combine. Set aside. 2. Heat the oil in a medium pan over high heat. When the oil is hot but not smoking, add the anchovies and fry until the anchovies are firm and evenly crisped, 3 to 5 minutes. 3. Drain the dilis on paper towels and place in a bowl. 4. While still hot, sprinkle the dilis first with lemon juice and then the dry seasoning mix. 5. Toss gently to combine.